Using ESO's Very Large Telescope, astronomers have confirmed the extrasolar planet status of two of the 16 candidates discovered by the NASA/ESA Hubble Space Telescope. One of the two confirmed exoplanets has a mass a little below 10 Jupiter masses, while the other is less than 3.8 Jupiter masses. The 16 candidates were uncovered during an international Hubble survey, called the 'Sagittarius Window Eclipsing Extrasolar Planet Search', or SWEEPS . Hubble looked at a large number of stars in the crowded central bulge of our Galaxy, covering a swath of sky that is no bigger than 1/50th the size of the full Moon. This tally is consistent with the number of planets expected to be uncovered from such a distant survey, based on previous exoplanet detections made in our local solar neighbourhood. Extrapolated to the entire Galaxy, the Hubble result provides strong evidence for the existence of at least 6 billion Jupiter-sized planets in the Milky Way. Hubble couldn't see the 16 newly found planet candidates directly. 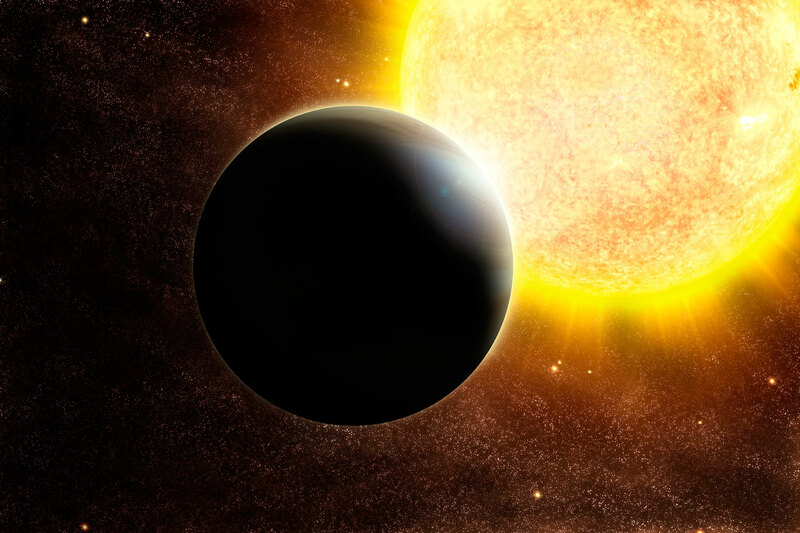 Instead, astronomers used Hubble's Advanced Camera for Surveys to search for planets by measuring the slight dimming of a star due to the passage of a planet in front of it. This event is called a transit. The planet would have to be about the size of Jupiter to block enough starlight, about 1 to 10 percent, to be measurable by Hubble. These planets are called 'candidates' because astronomers cannot be sure of their mass, hence of their status, without further spectroscopic measurements. Hubble monitored 180,000 stars for periodic, brief dimming in a star's brightness. The same small region of the sky was observed over a continuous seven-day period from 23 to 29 February 2004. To ensure that the dimming was caused by an object orbiting a star, the team used Hubble to detect from 2 to 15 consecutive transits for each of the 16 planet candidates. 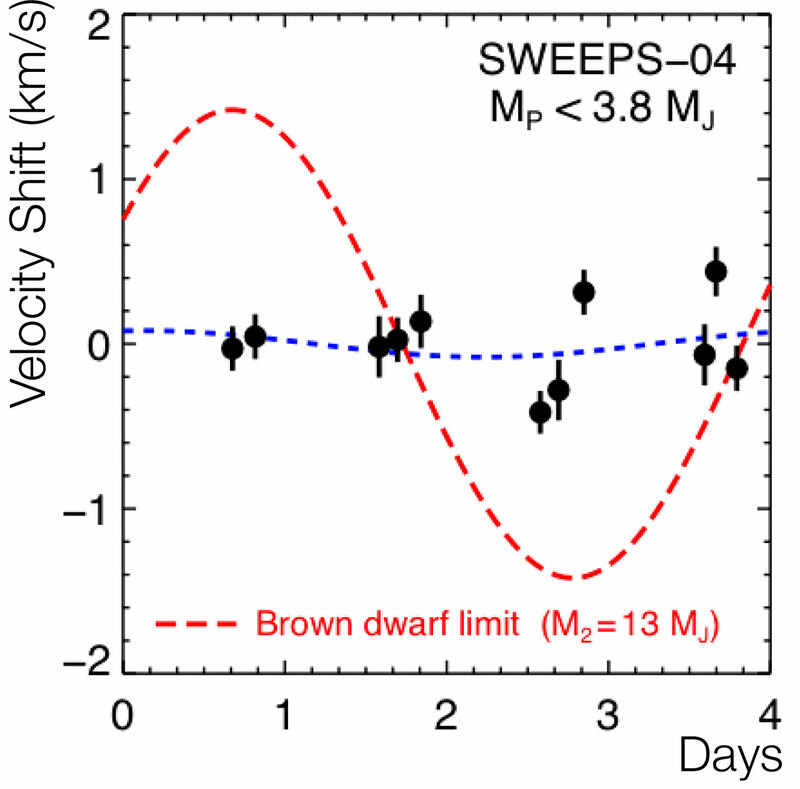 Two of the stars in the field are bright enough that the SWEEPS team could make an independent confirmation of a planet's presence by spectroscopically measuring a slight wobble in the star's motion due to the gravitational pull of an unseen companion. For this they used the UVES and FLAMES instruments on ESO's Very Large Telescope, located on Cerro Paranal in Chile. 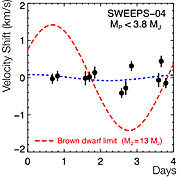 One of the planetary candidates has a mass below the detection limit of 3.8 Jupiter masses. It orbits its host star, which is 25% more massive than the Sun, in 4.2 days. The other candidate's mass is 9.7 Jupiter masses, which is below the cut-off mass for a brown dwarf  of 13.6 Jupiter masses . "This results beautifully illustrates the synergy between the HST and the VLT, once the corresponding capabilities are exploited to their limit," said Alvio Renzini (INAF, Italy), co-author of the study. These are the faintest stars with planets that have been confirmed with radial velocities so far. "Because the stars are so faint and the field of view is so densely packed with stars, it is not feasible to use this radial-velocity method to confirm the other planet candidates," said team leader Kailash Sahu of the Space Telescope Science Institute in Baltimore, USA. "To confirm them one would need a much bigger telescope on Earth, such as the Extremely Large Telescope currently under study at ESO and other observatories worldwide," added Renzini. : The term 'window' implies a clear view into the Galactic Centre, as much of the galactic plane is obscured by dust. : However, given the about 50% uncertainty in the mass determination it cannot be ruled out entirely that this object is a brown dwarf rather than a massive planet. The results will appear in the Oct. 5 issue of the journal Nature ("Extrasolar Transiting Planetary Candidates in the Galactic Bulge" by K. C. Sahu et al.). The members of the SWEEPS science team are Kailash C. Sahu, Stefano Casertano, Howard E. Bond, Jeff Valenti, T. Ed Smith, Mario Livio, Nino Panagia, Thomas M. Brown, Will Clarkson and Stephen Lubow (Space Telescope Science Institute, USA), Dante Minniti and Manuela Zoccali (Universidad Catolica de Chile), Nikolai Piskunov (Uppsala University, Sweden), Timothy Brown (High Altitude Observatory, USA), Alvio Renzini (INAF-Osservatorio Astronomico di Padova, Italy), and R. Michael Rich (University of California at Los Angeles, USA). Press releases on this discovery have been issued by NASA-STScI and ESA/ESO/ST-EcF.